COMT is one of the main enzymes involved in the breakdown of monoamine neurotransmitters which play a key role in depression (dopamine, norepinephrine, epinephrine). 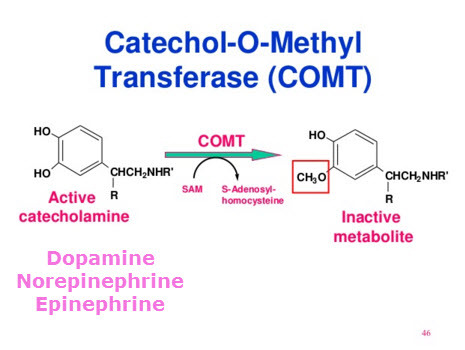 Either monoamine oxidase (MAO) or COMT are involved in the first steps in the breakdown of these neurotransmitters. See the diagram on the right. COMT is one of the ten genes that is assayed in the Genecept assay that we often use in people with depression who have not responded to initial treatments. People with low vitamin B12 (fairly common in the elderly) or low folate or low levels of folate activity (which can be related to having a particular form of the enzyme methylenetetrahydrofolate reductase (MTHFR) may benefit from supplementation with SAMe since B12 and folate are all essential factors in the formation of SAMe in the body. MTHFR is also part of the Genecept assay previously mentioned. For more on this subject read here about the use of methylfolate supplements.